American studio Renée del Gaudio Architecture has created a nature retreat for a remote site with spectacular views, composed of two buildings clad in cedar and topped with gabled roofs. Located near the rural town of Fairplay, Colorado, the project called Big Cabin Little Cabin is set on a rocky perch at 10,000-foot elevation. The lofty siting affords panoramic vistas of the Sangre de Cristo mountains, the Collegiate Peaks and the South Platte River. "Upon approach, the two cabins frame the sweeping view, and create a wind-protected space in between," said Renée del Gaudio Architecture, a studio based in Boulder. "A thick forest of bristlecone and ponderosa pines surround the property to the north, giving the cabins a sense of privacy and protection." To minimise the project's impact on the land, the cabins were built atop isolated pier foundations. Connecting the two buildings is a platform made of slip-resistant steel decking, with holes that allow snow to pass through to the ground below and space for a tree to grow up. "Great care is taken to allow an existing mature pine to surface through the metal-grate deck and stand proudly in the space between," the architect said. Taking cues from the area's early vernacular buildings, the cabins feature gabled roofs and basic materials. Cedar siding on exterior walls was stained black to help the dwellings blend with the forest. Inside, plywood lines walls and ceilings, helping to maintain a "low key and rustic" atmosphere. Ample glazing – including retractable glass doors – offers sweeping views of the picturesque terrain. "Large expanses of glass connect the occupants to the remarkable landscape beyond," the architect said. While both rectangular in plan, the cabins differ in size. 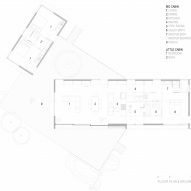 The larger contains an open area for living, dining and cooking, a gym and a master suite. The smaller dwelling houses two bedrooms and a bathroom. A simple, open plan allows natural light and breezes to pass through all sides of the buildings. A number of elements help keep indoor temperatures cool in the summer and warm in the winter, such as closed and open cell-foam insulation, double- and triple-pane windows with low-e glass, and rolling barn door shutters. "Heating is provided with a 96 per cent-efficiency boiler, radiant floor tubing set in a concrete slab, and a high-efficiency wood-burning stove," the studio said. LED lighting and high-efficiency appliances keep energy consumption to a minimum. The cabins are pre-wired for a three-kilowatt array of photovoltaic panels, which will supply all of the required electricity. Overall, the project is meant to blend traditional notions of a cabin with a modern aesthetic. "A cabin tells a story of its particular place and time in history, and of the people who dwell inside," said the architect. "Big Cabin Little Cabin strives to embody the character and sensation of a traditional cabin, and tell the story of this particular family, all within a purely modern framework." 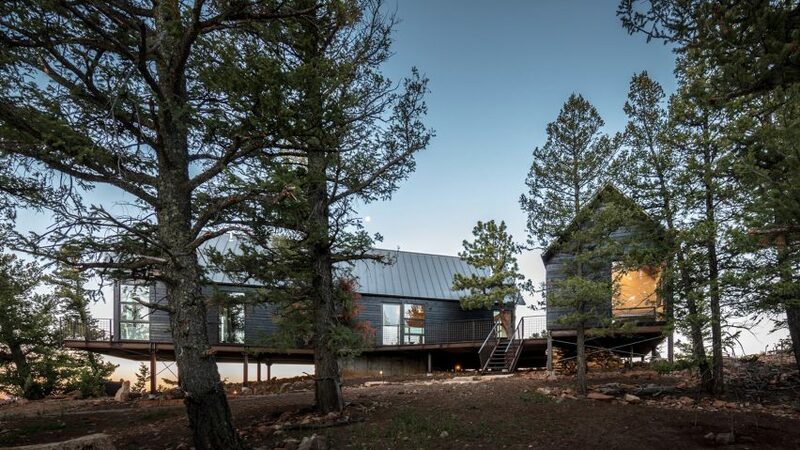 Other projects by Renée del Gaudio include a Colorado home clad in weathering steel that was built on a sloped site devastated by a forest fire.